A tried and tested workout to put your arms to work! Set aside 45 mins and hit the gym with this killer arm workout that incorporates varying grip positions, negative sets and drop sets to get your biceps and triceps really pumped. I’m a big believer in a whole-body approach to resistance training, ensuring no muscle gets left out and that it’s not just the “mirror muscles” getting put to work. Saying that, it’s no secret most guys that gym regularly will aim for great arms. This routine can be done solo or with a training partner, who will be of great help during the ‘negatives’ part of the workout. I’ve included links to the BodyBuilding.com exercise database for each exercise for instructions and demonstration videos. The resistance added needs to be high enough to take your muscles close to failure for the prescribed number of repetitions, unless otherwise instructed (such as with the negatives). 2-5 minutes on the rowing machine followed by some dynamic arm swings and circles to get the blood flowing should do the trick. 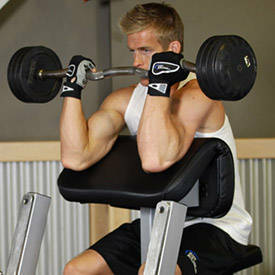 Start with the widest grip possible and perform the curl for 7 repetitions. Then put the bar down and adjust your grip to the middle section and immediately go into another 7 repetitions. Then put the bar down and adjust your grip to the narrowest point possible for a close-grip curl, and immediately go into another 7 repetitions. Rest for 90 seconds and repeat this set with another 21 reps total 2 more times. I like doing this exercise putting one foot in front of another and extending the rope in front of you with your head down, like this. Just ensure you keep your elbows together and don’t let them slide out too much to really target your triceps. Rest 90 seconds in between each set. Do this exercise on a high incline bench set to 90 degrees, standing behind the bench and ensuring the length of your arm rests against the long side of the bench, similar to the starting position in the first exercise, only that you’re now standing upright. Negatives means that for the contraction bit of the lift (when your forearm goes up), you use your other arm to help you lift the weight up. Or, if you have a training partner, have them spot you for the lifting phase of this exercise. The helping hand (or training partner) then lets go, before you lower your arm as slowly as possible. Ideally you will lower for as slow as 3 seconds minimum, aiming for 5 seconds, Then you use both arms/assistance again to get your working arm back up, before repeating. Repeat for as many repetitions as you can possible bear, ideally between 8-12 reps. Rest for 30 seconds before you repeat on the other arm. Then repeat another 2 times so each arm does 3 sets. Lowering the weight will become harder and harder for each rep you do, and when you can’t help but lower it in 1 second or less it’s best to stop the set there. As above, you perform this exercise by helping yourself or having your training partner push the weight up to its full extension with both arms, before the helping hand/partner lets go and you lower the weight as slowly as possible, ideally for 5 seconds. Then repeat. Catch your breath for 30 seconds, and repeat on the other arm. Then repeat another 2 times so each arm does 3 sets. Make sure your elbows don’t slide out too much on this one! Set the weight high enough so you can do around 10-12 reps before your muscles fail. 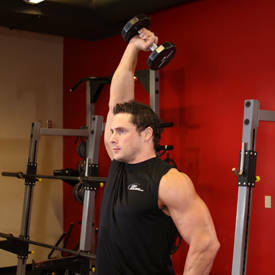 Then immediately drop the weight down one level lighter, and repeat for as many repetitions possible. Then drop it down and do the same thing again. Aim to drop the weight down 3 times so you end up doing 4 drop sets in total, making sure you push yourself to failure on the last one. It’s gonna burn, but it will be worth it! Exactly the same concept as above, with the starting weight enough to fail around 10-12 reps, drop the weight down and immediately perform as many reps as you can before you have to drop the weight down again. You do 3-4 drop sets total, lowering the weight for each one. Ensure you stretch out both your biceps and triceps after you’ve completed all 6 exercises. Happy arms day! Want to train with Bjorn? Bjorn is one of our fantastic gay personal trainers who are on hand to personally design you a training and nutrition program. Want to get the best results from your workouts? Get in touch! Should London Open a Naked Gym, Like This One?